German TZ newspaper prominently presented today Oliver Kahn, one of the most successful German players in recent history and his FC Bayern colleague as fans of Osho. © Leiprecht. 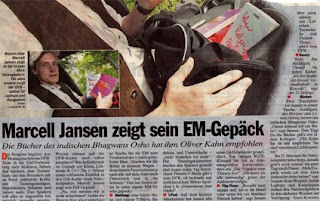 FC-Bayern-Spieler Marcell Jansen shows two Osho books by Edition OSHO which he bring to the training camp for the European Football Championship in Mallorca. Palma de Mallorca – The mountain hike begins. On Monday the team of the German National Football Association (DFB) left for Mallorca in preparation for the European Football Championship. In addition to the players, the coach team and a supervisor on board: many suitcases with tracksuits, towels, shoes and more.